Recently, Jack Engelhard, the author of the novel Indecent Proposal, recently wrote a column titled, A Blood Libel too Far which along with this article were the inspiration for us to put forth our two cent’s worth, or is that two Shekel’s worth. We hope to take these themes in a different direction, so please return and read our opinions and information after you have read the links, and please always read at least some of the links we provide. We are going to take the tack of giving a different look at what is the occupation under the treaties and conventions which apply to the formation of Israel, promises made and broken and what it all means under International Law, you know, the laws Israel is often berated for breaking by people who either have little if any knowledge or are intentionally fabricating their own inventions to plug their hatred for Israel and probably the Jewish People. As we have stated a few times, the applicable references under International law are San Remo Conference which codified by an international committee on April 25, 1920, the message and spirit of the Balfour Declaration, a letter written to Lord Rothschild by Arthur James Balfour, the Earl of Balfour and the British Foreign Secretary as an answer to the petition forwarded by Lord Rothschild from what would become the Zionist Congress concerning British intentions with the Mandate lands which were to be entrusted to them. The letter also pledged what the boundaries of the Jewish State were intended (map is at the link by the dotted brown line, the yellow line indicates what remained after the Arab initiated war of 1948) at the date of that correspondence, November 2, 1917. All of these and much more was internationalized and entered into International Law by the League of Nations in their Mandate System which divided up the lands from the Ottoman Empire, German Empire and Austro-Hungarian Empire defining new nations and stewardships to the allied powers to institute the desired goals set forth within the set intentions agreed upon at the League of Nations. The Mandate System ordered by the League of Nations was adopted and made enforceable by the United Nations under Article 80 and the related Articles of the United Nations Charter. These are the applicable laws, treaties, and pertinent statutes under which the lands of the vanquished powers were dealt. We often hear that only the Middle East and the Arab interests were intruded and altered and that they were the sole losers in these agreements. 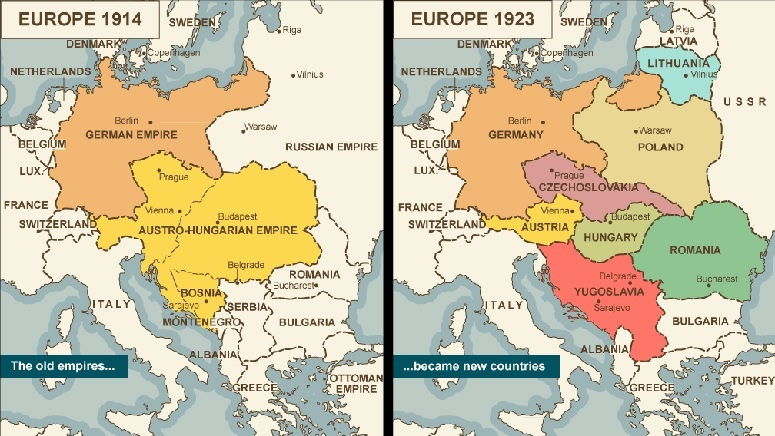 All one need do is look at eastern Europe today and Eastern Europe from pre World War I and one will quickly see that German Empire and Austro-Hungarian Empire were chopped up quite drastically as well and the German colonies in Africa were also stripped from Germany (see map below). The reason that so many people fall for the plight of the poor Arab people after the world imposed such draconian measures on only them is simply because there was so much resistance to allowing the Jews to return to their ancient homelands and the inter-familial rivalries over who would rule the disparate nations that unlike Europe which had been settled and done after World War I and suffered World War II while the Arabs complained. This is easy to understand as the Arabs are still attempting to destroy Israel by any means necessary with a possibility that the Persians of Iran might make an initial attempt before the Arabs go for their fourth attempt having failed in 1948 when Israel barely had a rudimentary army and little if any air force, again in the Six Day War of 1967 where they held a hundred to one advantage in virtually every military category, and their last attempt in the Yom Kippur War of 1973 after they caught Israel flatfooted and unprepared. Since then their new tactic is the plaintive wailing by the pathetic Arab Palestinians whose nation was swallowed by Israel. That is what we will be addressing along with a broader overview of applicable, related and hopefully useful information. The first thing which nobody ever appears capable of understanding is what war on what dates and through what imaginative manipulations did Israel ever fight an actual war with any nation named Palestine. There is an honest and easy answer, it never occurred. The next and slightly more general question is when was any nation named Palestine declared and what were its borders, leader, currency or anything else which can be verified to prove its existence beyond the letterhead currently decorating the Palestinian Authority, a renaming of the PLO so as to allow them not to be seen as the international terrorist organization which invented such things as plane hijacking, suicide bombers and a host of other terrorist tactics. We can guarantee you that anybody asking such idiotic and completely irrelevant questions of supporters of the Arab Palestinians will quickly be shouted down if not violently attacked by the supporters of the fictitious state of Palestine. Palestine was half of the name given to the province of Judea by the Romans after their defeat of the Judeans, already referred to simply as Jews (Rome spelled it simply Ju) so as to remove any reference to the Hebrews, Israelites, Judeans, Samarians or anything else which related to the people they were about to disperse so as to remove them from history. Anybody will tell you that the first thing you need to do to erase a people from the remembrance of humankind and write them out of history is you must change the name of their area and its capital. So Judea became part of greater Syria and to rub salt into the wounds of the Judeans, they gave their region the subtitle Palestinia which was the Roman name for the Philistines, which is strange that the Romans chose a name of an already dead and gone from the world stage peoples in order to make the Jews disappear from history. That is the reference the Arabs also chose in order to finish what the Romans failed to do, rid the world of the Jews, or at least the Jewish State. As for the being assaulted either verbally or physically, trust us, one of us has been foolhardy enough to ask such questions and received various levels of brutalizing, but he can handle that. There is nothing which differentiates the Arabs who go under the name of Palestinians from the Jordanians, Syrians, Egyptians, Saudi Arabians, Iraqis and a number of other Arab nations as these were the places from which they emigrated to the region after the mid nineteenth century after the arrival of the earliest Zionist Jews who understood that their was a primary requirement if Zionism was to succeed, that was water. They began very early with water conservation and irrigation and found means of preserving water, any water, they could from the rainy season to use the rest of the year. A short detail of the history of Israel and water can be read here from Wikipedia. With an economy which was growing and far exceeding the neighboring Arab states, Arabs came to Israel for the jobs, as well as some who came to steal from and shoot at the Jews. What people do not tell is that the approximately twenty-percent of the Israeli population which is Arab have every and exactly the same rights as every other Israeli; be they Jew, Bedouin, Druze, Baha’I, Hindu, Buddhist, Muslim, Coptic, Christian or any of the numerous other peoples who are a part of the patchwork quilt that is Israel. The Arab Palestinians who reside in the regions formerly illegally occupied by Jordan after the 1948 war, renamed it West Bank from Judea and Samaria for the same reason the Romans had renamed it to make it not sound as Jewish, are not Israeli and Israel does not rule them, the Palestinian Authority, or more accurately, Mahmoud Abbas rules them. In the region, which Egypt illegally occupied after the 1948 war known as Gaza are also not Israelis and are not ruled by Israel but by Hamas under a dictatorship where the terrorists of Hamas choose the leadership and the people obey. Guess what that means, there is no occupation of the Palestinian Arabs because Israel does not rule over them. What it also means is they are sitting on Israeli lands, that part they have correct as is their claim that there is an occupation, and there is, and it originates with the Jordanian illegal occupation of the parts of Judea and Samaria (they renamed West Bank as stated above) and with the Egyptian illegal occupation of Gaza. So, the real question which requires a truthful answer is who is occupying whose lands. The reality is the Arabs are occupying Israeli lands. Well, we hope that was a refreshing and new idea for at least some to ponder. Here is another one to ponder, what is the origin of the “Palestinian Flag” and where did it come from? The easy way to figure this out is to simply compare it with another flag which we have pictured below. Further, one need look no further than the original 1964 PLO Charter Article 24 which reads, “This Organization does not exercise any territorial sovereignty over the West Bank in the Hashemite Kingdom of Jordan, on the Gaza Strip or in the Himmah Area.” So, the exact regions they are claiming was their precious nation of Palestine were the exact regions they made a specific disclaimer of any intent to rule them as they were already under Arab rule. Once the Six Day War ended and Israel had liberated the parts of her lands occupied illegally by Egypt and Jordan, then things changed and the disclaimed lands became the claimed lands. What is being allowed for the rest of the world to believe is that the Arabs, be they Palestinian or just Arabs, have never ceased to claim is all of Israel. The current charter still has all the statements which were within the original with their removal of the disclaimer over Gaza and West Bank” (Judea and Samaria or Shomron) but they still also claim all of Israel. They teach in their schools that the children have homes in Tel Aviv, Netanya, Akko, Ashdod, Eilat and every other city within the 1949 Armistice Line also called the Green Line. There is an easy way to remember what the Arab Palestinians really mean when they say the Jews are occupying their land, and that is to remember their chanted slogan at almost any rally held on any Western World campus, “From the River to the Sea, Palestine will be free.” That and a few other choice chants are in the video below, we apologize in advance for any insult to your ears that may be caused by the chants and their genocidal nature. With this advisory opinion, we will simply let things rest as it ends any honest threat as Justice El Araby warned; the International Law is not your friend against the Israeli claim. For one last item, if you wish to wish to understand where the Palestinian Arabs came up with such a complete and long history in the area of Israel, read the Old Testament and then any of the myriad of historical writings of Jews and the Jews love and remembrance of the land and their longing to return becomes evident and if you replace Jew, Jewish and Zionist with Palestinians you get their history except Palestinian Authority President Mahmoud Abbas asserts, “We said to him [Netanyahu], when he claimed the Jews have a historical right dating back to three-thousand years B.C.E., we say that the nation of Palestine upon the land of Canaan had a seven-thousand-year history. This is the truth that must be said: Netanyahu, you are incidental in history. We are the people of history. We are the owners of history.” Seven-thousand years ago, the Arab world was contained in the Arabian Peninsula where they still sacrificed people, often babies, to their plethora of gods. Some claim one of them was called Allah, we are not experts and do not know, but you can bet they had one named Baʿal or Al-‘Uzzá, Manāt, Rahman or any of the reported three-hundred-sixty idols of many gods and goddesses said to have been kept in the Kaaba itself. Palestine is the Arab attempt to erase Israel, nothing more and nothing less, but Israel intends to remain the Jewish State and under International Law they could be legally expelled from the land and sent back to Egypt or Jordan or wherever their names place their origins, but the world does not desire the Arabs to be sent from whence they came, they want the Jews, and not sent anywhere, just gone.